Headquarters of The Jugs Social Club, "New Orleans Most Talked About Club," known for their Mardi Gras parade and hosting community events. The Jugs Social Club was founded in the spring of 1951 by nine young enthusiast from Algiers; Ernest Brunet Jr., John Brunet Sr., Larry Bowie, Paul Richards, Alton Richards, Morris Richards, Harris Martin, Alvarez Phillips and Harold Ramson. The founding members wanted to establish a carnival organization with entertainment as its primary function but they would become more than just entertainment. In the early 1960s, the Jugs crew built floats for All Saints Catholic School’s parades, also located in Algiers, and became fascinated with the thought of having their own parade crew during Mardi Gras. After years of trying, the club did not secure a permit to parade until 1969 and the first parade was held in 1970. It was then that NOMTOC was created. The name NOMTOC or New Orleans Most Talked About Club gave a sense of pride to these Algerines, especially because there was only one other African American Mardi Gras Parade running and that was the Crew of Zulu, located on the East bank of New Orleans. That very first parade only had 6 floats but now there are over 20. After Hurricane Katrina, NOMTOC remained the only parade to run on the West Bank of Orleans Parish because all of the other crews either disbanded or moved to the more popular East Bank of New Orleans. For some Algiers residents, especially those who are unable to travel to the East Bank, NOMTOC is considered “their Mardi Gras”. Today Jugs is still a social aid and pleasure club and are known not only throughout Algiers but throughout New Orleans as leaders in the community as far as giving back with back with school drives, Thanksgiving giveaways, health fairs and lots of other community outreach events. The Jugs Social Club often collaborates with the Mardi Gras Indian tribe, the Mohawk Hunters who is the oldest Mardi Gras Indian tribe in Algiers. In 2019 JUGS also collaborated with the Zulu Social Aid and Pleasure Club by welcoming Zulu to the West Bank to celebrate Zulu’s annual Flag Raising event, an event that was held on the West Bank of New Orleans for the first time ever. 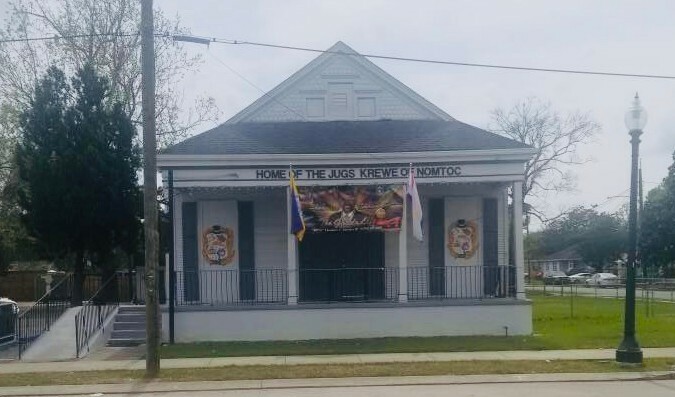 Jugs Social Club Headquarters ~ Source: Monisha Jackson, Photographer ~ Creator: Monisha Jackson, Photographer ~ Date: March 2019. Monisha Jackson, “Jugs Social Club,” New Orleans Historical, accessed April 24, 2019, https://neworleanshistorical.org/items/show/1458.